This data is, at the very least, lesser known, so let’s see if I can’t do my small part to get it out there as part of my quest to understand Apple Inc. just that one little bit better. This one probably would’ve gone overlooked until at least fiscal 2015, had it not been for a retail reconciliation covering fiscal 2012-2014 that Apple released (probably a bit “grudgingly” – I blogged about it a few months back). First, the data. Then, where to find it (hopefully going forward), which conveniently segues into the next section. It’s only three fiscal years of knowable data, and only three data points at that, but still interesting, as I noted in my earlier quick blog post. Wait a second. Apple doesn’t report data for Taiwan. Well, yes and no. On the “yes”, I’m about 90%+ confident, although Apple IR is welcome to correct me if I’m wrong. And…yes… 😀 … Apple doesn’t report data for Taiwan directly. Yet due to a fascinating quirk in its revenue geography reporting (will the status quo be maintained going forward? ), plus a recent accounting adjustment, it now does, indirectly. Interesting, huh? “China”. Not “Greater China”. Ask the experts as to why, but seems Apple might be required by accounting regulations, SEC, FASB, GAAP, international, whatever, to disclose certain information whenever a customer or country accounts for more than 10% of annual sales. More on that later. So, you have China defined “geopolitically” (if I’m typing that right): Mainland China plus Hong Kong. Notice how Taiwan’s missing? “But wait!” you reply. “How can you be so sure you can get directly to FY 2012-2014 Taiwan data from here?” Two reasons. First, Apple has specifically given out Retail-inclusive, reconciled data from FY 2012-2014 for “Greater China” – so there’s no (GAAP) revenues unaccounted for in that rev geo. 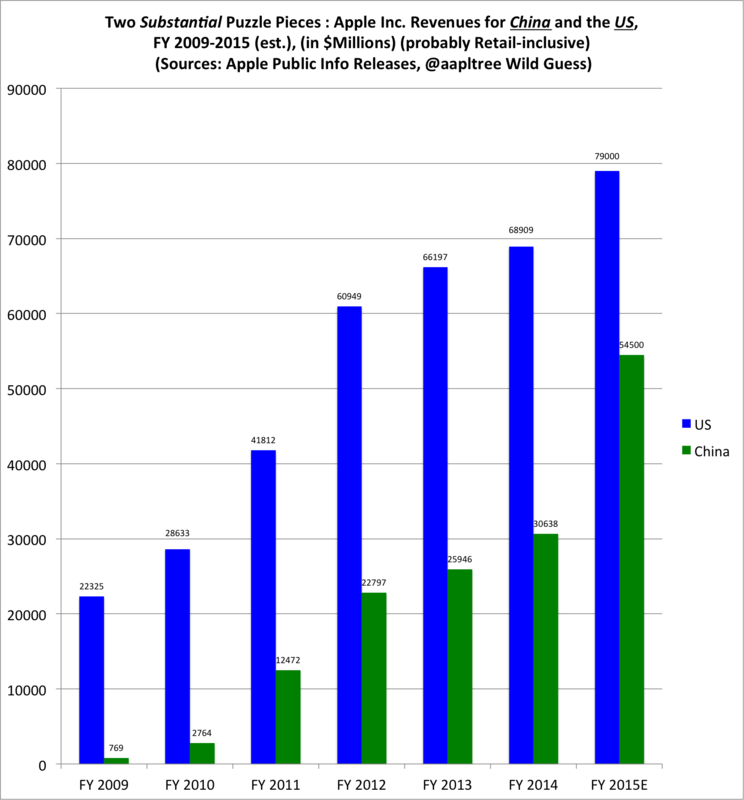 Second, when you compare the “China” data to the ex-Retail Greater China data (which is provided by Apple in that reconciliation) and apply a little plain language analysis (sales by actual country), it seems very clear that the China data encompasses Apple (brick-and-mortar) Retail (Store) sales. For instance, ex-Retail Greater China revenue for FY 2014 was $29.846B, while “China” revenue was $30.638B for the same period. Without mainland China plus Hong Kong including Apple Retail Stores, that number wouldn’t make sense. Now for some not-so-hidden, but arguably even more interesting data. First, a little commentary on the annual revenues of Apple’s two most important customer bases – the populations of the United States and China. Mostly about iPhone, with a side of iPad and some unknown continuing boost from Mac? Pretty much. 😉 And if you think the jump from FY 2009 ($769M) to FY 2014 ($30.638B), a nearly 4000% increase, is impressive, just wait until the FY 2015 numbers are presumably released. At this point I’d say a decent fraction of you might be asking – as I would have up until yesterday – “wait, wasn’t Asia Pacific the reported revenue geography back in fiscal 2009?” Yes, “Greater China” wasn’t an official segment until Fiscal 2012/2013. 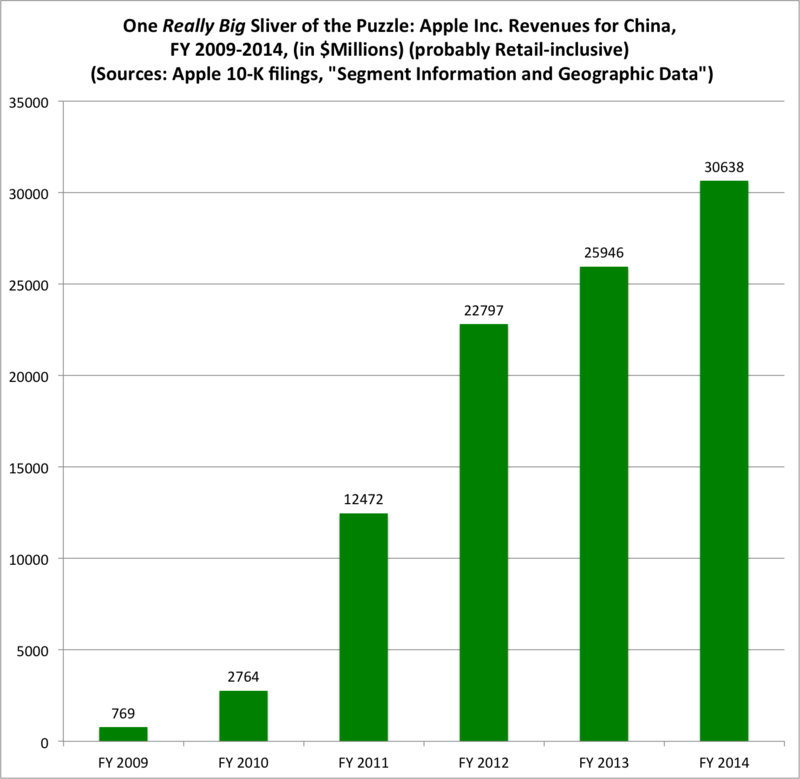 However, luckily for us – as at least one Apple commentator by the name of Horace Dediu noticed within the 10-K years before I did – China crossed the 10% threshold of total annual revenue in fiscal 2011 ($12.472B regional vs. $108B total). And as a bonus, Apple reported the prior two fiscal years’ worth of China revenue (as I’m guessing it was required to, see page 74 of the 2011 10-K). Now that you know where to find the annual revenue data for Taiwan, China and the US (at least until Apple changes things up somehow), I’ll wrap up with a quick note on China and US revenue (UPDATE – which Apple mentions in every quarterly release as domestic – whoops). Sure, the US may not be growing “much”, but look where it is now, with the iPhone 6/6S/Plus wave still in progress, plus the arrival of Watch, plus a little help from the old stalwart Mac, plus iPad sales potentially reversing to steady growth and some point. (Oh, can’t forget the new-lease-on-life iPods finally being less of a weight on Other Products.) Most importantly, Apple is still growing sales in its stronghold/home country at all, which never hurts. Contrast: iPhone stealing the competition’s lunch in South Korea, as per Apple’s latest conference call. FY 2015 represents a bit of wild guesswork on my part, but given the “blended” YOY trends as seen in the Americas, plus the not-so-hidden trends in Greater China (of which Taiwan is probably far less than 5% of at this point)…”mind the gap”. Or should I say, the rapidly closing one. Thanks to iPhone 6 + China Mobile, Apple’s bounded its way to a stunning new level of success that I’m guessing will lead to around 80%, and possibly more, YOY growth when Apple presumably reports China-specific revenue results in its 2015 10-K, due out around October or so given past history. 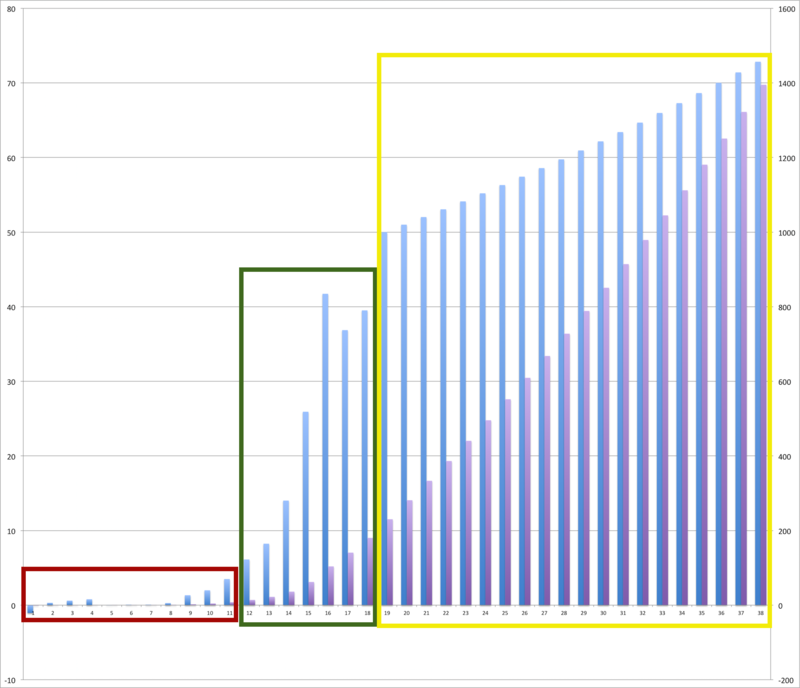 Maybe this chart alone is sufficient to stand in for that other blog post I was thinking of writing up. Because when China/Greater China growth cools down from its torrid 70%, 100%+ year-over-year pace…well, it’s really quite normal and expected. And let’s be honest, here – it really won’t take anywhere near 70% annual growth, given Greater/China’s incredible scale, to keep Apple’s overall business growing nicely, sustainably and, despite whatever the bears and skeptics may tell you, at a more than reasonable level for the supergiant $200B+ annual revenue weight class, which no pure-play tech company in history save Apple has ever joined before. This information is currently found in the “Segment Information and Geographic Data” section of Apple’s 10-K filings. Yes, there’s also some interesting annual data on “long-lived assets” for the US, China and rest-of-world. Perhaps another time. 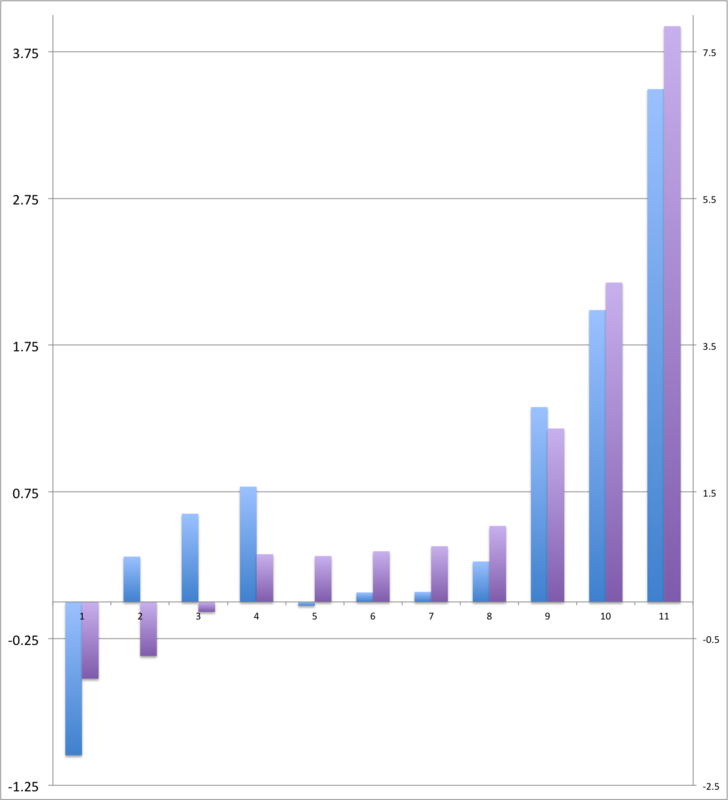 Bonus/Aside: While only an indirect and annual (UPDATE: NOPE – quarterly, I regret the error) clue, US-specific revenue is still useful for horseshoe-tossing things like US cash generation (capital return). Apple has given out annual revenue data for Taiwan for the past three fiscal years. At least I’m quite sure it did. I found this data basically by accident (hint: it’s a little scattered), and yet once I found it, I very quickly knew what it was. For my next super-annoying puzzle: Guess how. 😉 Yes, you can find it too, it’s all there, in the “hiding in plain sight” category. No shoe leather required, in journo-speak. It was all there for a few months, it was just waiting to be found. Based on the very few data points, seems Taiwan revenue grew around 11.6% year-to-year in FY 2013, and 13.5% YOY for FY 2014. Taiwan sales crossed the $1B mark in FY 2013, presumably for the first time. Good, steady business in that country, apparently, and Apple has had a presence in Taiwan for some years now. 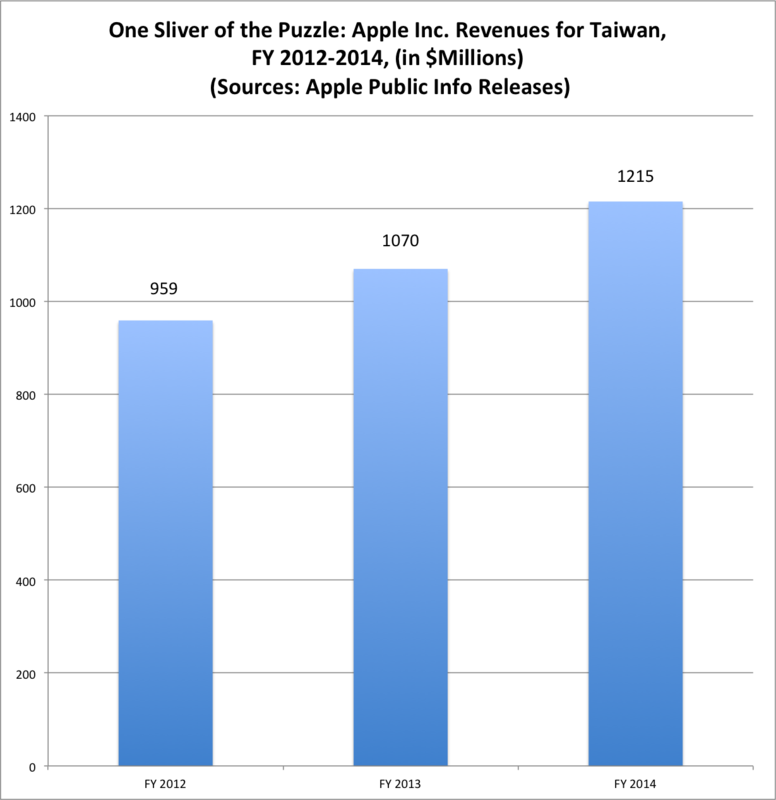 Will Apple “provide” Taiwan annual revenue data once again (in indirect fashion) for fiscal 2015? Seems so given recent reporting methodology. Farther out than that? We’ll see. A very interesting piece of the puzzle, in any case. The red of tumult, struggle, grimly faithful companion of sweat and tears. Verdancy, at long last, celebrated and doubted. A vision at once near-unthinkable, mundane, fantastic. Inherently uncertain, even as a record not yet written already knows. What was I, what am I? What might I yet be? Am I one, more than one, inseparable from the more? Feel free to ask, discuss, or guess, whether on Twitter or in the comments below (you just need to choose a name and start typing). Enough right answers may lead to a follow-up, or simply the end of the puzzle. Otherwise, perhaps another clue. I do like puzzles, even if I might not be the best at crafting them (to say nothing of poetry). Hope you have a little fun with this one. Welcome to the AAPL Tree’s ninth consecutive home game quarterly earnings preview.